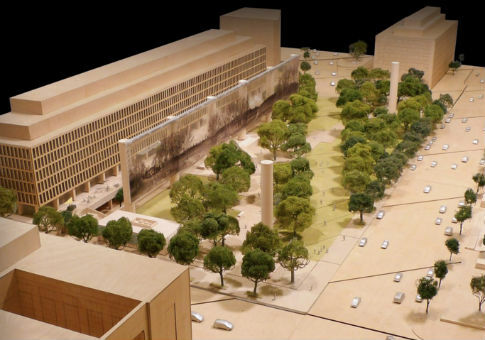 The Eisenhower Memorial Commission has requested $84 million over two years to build its memorial to Dwight Eisenhower, a project that has been stalled for years due to opposition from the Eisenhower family and members of Congress. The commission asked Congress for $43 million for construction costs and a further $1.8 million for operating costs in fiscal year 2017, according to a budget request released last month. The commission noted that "a separate request of $41 million in FY 2018 will be necessary to complete construction." The Eisenhower Commission has cost taxpayers $66.3 million since its inception in 1999, a sum that includes over $37 million in construction funds allocated by Congress in FY 2012. Congress has zeroed out the commission’s construction funds the past three years, in part as a consequence of the wishes of the Eisenhower family, members of which oppose the memorial design by experimental architect Frank Gehry. The memorial features three bronze statues of Eisenhower at different stages in his life: as president, Supreme Allied Commander, and as a lanky Kansas farmboy. All three statues are sculpted in a slightly-lumpy and misshapen though still representational style. 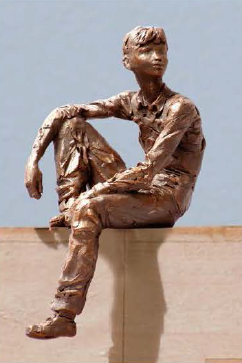 The statue of a young Eisenhower, which has been the subject of controversy, depicts the boy looking off into the future, chimpanzee-like limbs draped over his legs. Looming over the memorial’s statuary will be a 447-foot wide steel tapestry suspended by eight-story high limestone columns. 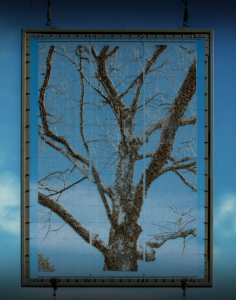 The tapestry will depict the landscape of Abilene, Kansas, and is meant to honor the Midwestern values that Eisenhower exemplified such as "modesty," according to a statement by the executive director of the National Capital Planning Commission. The north side of the memorial features two additional, freestanding limestone columns. Eisenhower granddaughters Susan and Anne Eisenhower have compared the Gehry design to a "theme park" and called for a simpler design without the metal tapestry and columns. Grandson David Eisenhower resigned from his position on the commission in 2011. The commission has defended its choice of the Gehry design, rejecting calls for a reboot to the design process. It has touted the impressive membership of its Advisory Committee, which includes every living president and vice president, six secretaries of state, and four secretaries of defense—although these public figures have mostly commented on the importance of the memorial in general terms, without addressing the divisive Gehry design. "We are completely comfortable with the design and the broad support for the design that has evolved into a strong consensus," commission spokeswoman Chris Cimko said. "Both federal panels have approved the design; all former presidents and vice presidents support it along with dozens of former cabinet members, congressional leaders, members of Congress, chiefs of the military services and flag rank officers, governors, public policy experts, some of America’s most highly respected captains of industry, and three of the most recognized voices for the Greatest Generation: Tom Brokaw, Tom Hanks and Bob Dole." As it is unlikely Congress will allocate the requested $84 million in construction costs, the commission now plans to bypass Congress with a fundraising campaign spearheaded by Bob Dole, a World War II veteran. In its FY 2015 budget request, the commission reported $447,618 in contributions and predicted that millions more were forthcoming. The budget request released last month did not report any fundraising numbers, but stated that its fundraising arm would "re-approach a significant pool of top donors" to ask for donations, including "those who have an affinity for Frank Gehry and his work." Justin Shubow, president of the National Civic Art Society, a group critical of the Gehry design, said that the commission’s fundraising problems show the need for a new design. "In its budget justification, the Eisenhower Memorial Commission tellingly did not report any fundraising successes. The grandiose, deconstructionist design is wildly unpopular, which is why the public, and even Gehry's friends, are refusing to fund it," Shubow said. "The design is dead, which is why we need a new open competition to reboot the memorial as soon as possible." The commission has blamed "unbalanced and misinformed media coverage of the memorial" for stymying its fundraising efforts.